This book costs £60 to members of professional accounting bodies (post free within the UK and Ireland) - contact us with your details of membership. Libr. XV is unique in the history of business and its first technology, accounting. It shows how accountants were taught and what they needed to know in the Renaissance. Libr. XVcontains two manuscripts first bound into one volume in 1476. The first was written in 1458 on how to be a successful merchant. The copy presented here was prepared in 1475 and includes a description of the method of double entry bookkeeping. The second dates from 1475-6 and is the earliest known textbook on how to do double entry, some 18 years before Luca Pacioli published his Particularis de computis et scripturis (Concerning reckonings and recordings) for which he is widely acclaimed as the 'father of accounting'. Together they provide a clear picture of the nature of business at that time, and the way in which merchants maintained their financial records. They also highlight the complexity of some of the issues which merchants faced, many of which still resonate today. The roots of Pacioli’s text can be seen, making this book the first step towards double entry and accounting being standardised into the practice we recognise today. Above all, [the author's] great contribution to the subject is this carefully prepared and magnificent facsimile edition of Libr. XV, on gloss paper, a deluxe edition to which has been devoted considerable attention and much painstaking effort. Thanks be, therefore, to this distinguished and courageous investigator who has provided the entire community of accounting historians with this magnificent gem consisting of the facsimile manuscript of the two earliest known texts dedicated to teaching double-entry bookkeeping. I am pleased to congratulate you on being selected as the 2015 recipient of the President’s Hourglass Award. This award recognizes scholars in the history of accountancy thought who have made substantial contributions to the literature in particular as well as over their careers. Your recent 2014 book length treatise Libr. 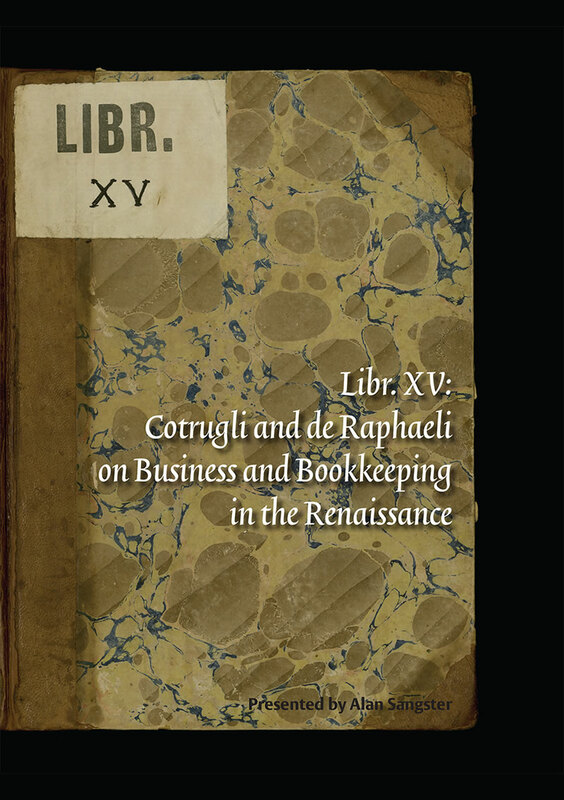 XV: Cotrugli and de Raphaeli on Business and Bookkeeping in the Renaissance provides potentially important insights into the pre Pacioli literature and will enable researchers to expand their understanding of the cultural and environmental factors influencing the development of double entry technique and accountancy development per se.